I'or the most part a plain-looking cranc of grassland and marshes, this bird's presence is given away by its bright head color and far-carrying calls. 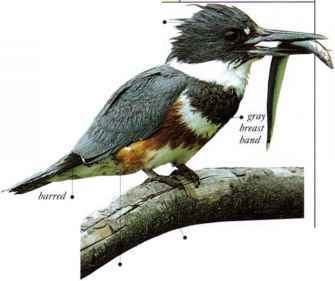 The calls are used as part of the pairing display and arc-also tittered in flight. The diet consists of insects, frogs, mice, seeds, and other parts of green plants. In winter, cranes visit tlricr habitats, such as farmland. • Nest A mound of reeds, grass, and other vegetation, with a shallow hollow on top, often in a marsh and located near, or in, shallow water. • DISTRIBUTION Breeds across Eurasia. Winters in S. Eurasia, N.W. and N.E. Africa, India, and China. .. of the spread of human settlement It occurs in areas where this type of YV Ty^f habitat remains, also spreading into birch scrub juvenile or woodland. i Ik- large, white wing patches 011 the gray plumage of this species are noticeable in (light and in display. 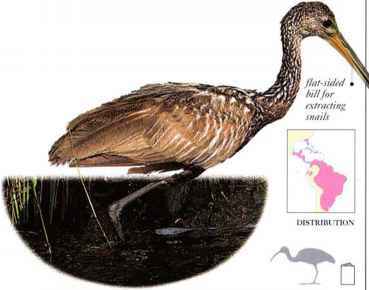 This crane inhabits marshland, where it feeds on animals such as large insects, frogs, and toads, and on grain and other plant materials. It is seen ¡11 heavy (light, with neck and legs drooping slightly, or roosting in trees. Mated birds displa to one another with a leaping dance and loud, two-note calls. • NEST A large, flattened mound of reeds, rushes, and grass, screened by vegetation, in a marsh. • DlSTRIBl ITION l-'rom I Iganda and Kenya to South Africa. 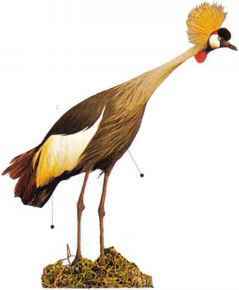 • Remark A closely white related species, the wing Black Crowned-Crane, patch is found along the southern edge of the Sahara and in Sudan. I his bird gets its name from its loud, trumpeting threat call, uttered with outspread wings. In friendlier situations, it utters low, booming notes. 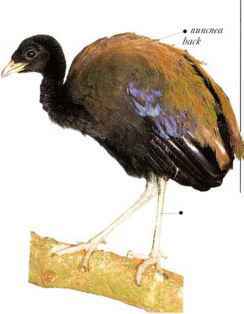 It is chiefly a ground dweller and is normally seen walking, with a hump-backed posture. With its long, strong legs, it can also run fast. The wings are rounded and weak looking, anil flight appears laborious. In spite of this, the birds always roost fairly high in trees. They feed on the ground and are normally seen in small social groups. The diet consists mainly of fallen fruit, nuts, and insects. Trumpeters rely on other tree-dwelling animals, such as parrots and monkeys, to knock these down while feeding, and will also take berries and some insects. Little is known of their breeding behavior. • NliST A loose structure made of sticks and leaves and placed high in a tree, in a large tree hole, in an open cavity, or on a bare branch. Middle and lower Amazon basin in DISTRIBUTION C. Brazil.